It’s time to get serious about learning Italian. Eighteen months from now Emma will graduate from high school and leave home for college. At that point we are going to sell our house in Chicago and spend as much time in Italy as possible. I don’t plan on being one of those Americans who relies on everyone else to speak my language. After all, a huge part of Our Big Italian Adventure is enjoying the people, and you can’t exactly do that if you can’t talk to them. Ed is already way ahead of me. He has been studying Italian on his own for a couple of years now. He is disciplined about learning grammar and verb conjugations, which I am not. Also, he does Skype lessons twice a week with his Italian teacher on italki. It’s a great deal. He spends one hour talking with a native Italian speaker for only $15. I plan to do this, too, once I can string together more than one sentence. The one thing I have going for me is that I (used to) speak Spanish. So many of the words are similar that I can understand a fair amount if someone is speaking slowly. Where the wheels come off is when I try to speak Italian. I open my mouth and Spanish is all that comes out. So, I’ve given myself a challenge: I will be able to speak Italian by June 2019. Other than a trip or two to Italy between now and then, I will have to accomplish it while living and working in the U.S. I am taking a weekly Italian class at the local adult ed program. I didn’t sign up for the absolute beginner level because I didn’t want to spend the next six months learning to say, “My name is Anne. I am a woman.” So, with a little trepidation I signed up for level 2. I’ve actually been to about four classes so far and I’m no worse than most of the people in the class. I enjoy it but have concluded that I’m not going to get very far by only taking this class. It’s not immersive or demanding or frequent enough. What it has done is give me a much-needed nudge to get started, and it’s given some structure to my study. Plus I really like the people in the class and our teacher provides lots of great insight on the history and culture, as well as the language. The one I am trying is Duolingo. It’s free and it’s kind of fun and addictive because it’s structured like a game. Every time you give a correct answer it plays a little trumpet fanfare sound. As you complete a section you earn “Lingots”, though I am not exactly sure what you’re supposed to do with them. It also tracks how much you learn and how long your streak is (days studying in a row without missing a day). You translate words and phrases from Italian to English and vice versa and it repeats them until you get them right. For me it’s a good supplement to the other things I’m doing, but it wouldn’t be enough on its own. The other online course I tried is Italianpod 101. I found it kind of annoying for a couple of reasons: first, because the dialogues are too short and there’s too much focus on English translation. Second, the two people who do the dialogues keep up kind of a goofy banter (in English). I guess it’s to keep things light and fun, but I could do without it. Plus every lesson starts with about 30 seconds of opera music before the dialogue. I don’t like having to sit through that. Ed turned me on to an awesome app called Anki. Anki is a spaced repetition system that helps you memorize things. It’s like flashcards on steroids. If the word comes easily to you it doesn’t show you the word again for a while. If you have difficulty, it will keep showing it to you every few minutes or days until it has driven that word deep into your brain. I love it. I have learned hundreds of new words in the last couple of weeks just by using Anki 10-15 minutes a day. Another tool I use is Word Reference, which is an online Italian-English dictionary. I keep the site open on my computer so I can quickly look up words with all their various meanings and usage. I need to develop my ear for the language, so I listen to all kinds of things in Italian, usually when I am driving around or waiting in the carpool line. One of the first things I’ve tried is “Teach Yourself Italian” by Vittoria Bowles. I like the no-nonsense approach to learning the basics. I don’t have the book she references. I just listen to the dialogues and repeat as instructed. News in Slow Italian is a weekly podcast about world news. The site has lots of other tools for learning the language and there is a subscription fee, but I listen to the news podcast on my phone and that doesn’t seem to cost anything. It’s challenging to understand everything but they do speak slowly enough for someone at the intermediate level to follow along. I also found a TV show called “A Good Season” on Acorn TV about a family of winemakers in the Trentino region. It’s in Italian with English subtitles. I tried to watch it without looking at the subtitles, but at this point I can barely understand anything. They talk way too fast. The great thing, though, is that I can keep watching the same episode over and over and then maybe I’ll start to get it. Acorn TV is a subscription service like Netflix but with foreign shows and movies. It costs $5.00/month but there’s a free trial available. There are some great shows from England, Australia and other countries. If you liked “Downtown Abbey”, you should check out “A Place to Call Home.” But I digress. At this point I am mostly using the exercises in the textbook from my class to practice reading and writing. I am on the lookout for some easy texts to read. I am considering going over to Italy for a week in January just to take a course. I will go by myself and take four hours of group lessons and one hour of private instruction each day. I may even be able to stay with an Italian family to make the immersion complete. My Italian teacher has recommended that I not go to a big city where most people speak English. In smaller towns fewer people know English and they are much more patient with Americans practicing their Italian. So, that’s my plan. If I can sustain all of this I should be able to make decent progress toward my goal. I think the key will be to do something every day, even if only for 15 minutes. 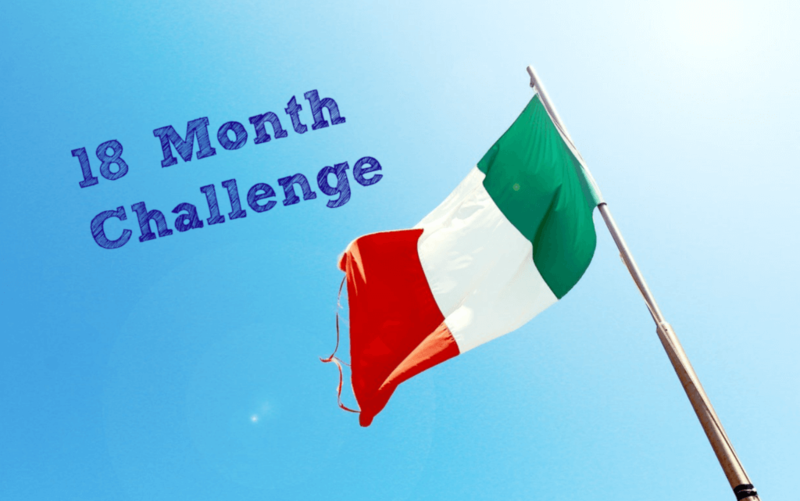 Have you tried learning Italian in 18 months or less? How did you do it?